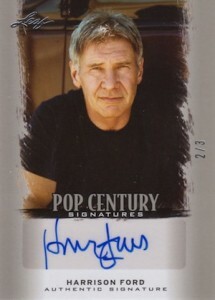 Harrison Ford has been a famous holdout when it comes to autographed trading cards based on his movies, so on the rare occasion that his signature is included in a set, those cards can fetch top dollar on the trade market. This detailed checklist and guide compiles the cards that Harrison Ford has signed from Star Wars, Indiana Jones, Ender's Game, and Pop Century sets. A quick search on eBay will pull auction results ranging from $150 to over $5,000 but don't let that dissuade you from jumping into this highly lucrative trade market as even the most inexpensive Ford autos can be an important addition to your collection. 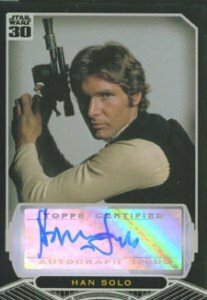 A Han Solo card from 2007 sold for $10,000 - obviously not the norm - based on the rarity of the card and the rarity of Ford's signature. This doesn't mean that you can sell any Harrison Ford autograph for the price of a used car but it also doesn't mean that the casual collector will be priced out of the trade market. Collectors with a keen eye and a bit of patience can find deals on these autographs that, despite being higher priced than most cards, won't break the bank. It is important to note that there have been Star Wars card sets since the original movie was released in 1977, but the inclusion of autograph cards is a fairly recent addition with the first autographed card being released in 2001. Based on the long-awaited sequel finally coming to fruition, there has been a dramatic increase in Star Wars merchandise and the entertainment trading card market has not been immune with Topps being the license holder for what will probably be dozens of card sets. 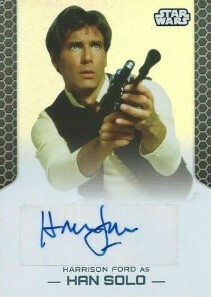 While it is now more common to see Harrison Ford's signature on autograph checklists, he is primarily relegated to short print cards, redemptions, or very hard to find chase sets and this scarcity keeps the value of his signature very high. It is unlikely that more of his cards will sell for $10,000 any time soon but if you happen upon one of these cards in your collecting and can't wait to sell it, you'll likely fetch a hefty sum of money. Be aware that there are never more than a few of each option available at any given time, and many of the cards rarely surface. 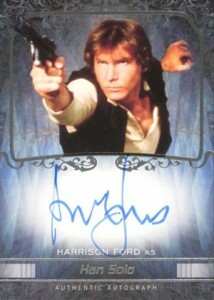 There are other Harrison Ford autograph options that come as cut signature cards, but this guide only covers the sets where he directly provided his signature. This is it. The granddaddy of all Star Wars autograph cards; the 30th Anniversary set of 2007. The odds that you'd open up a pack and have this classic image staring at you is 1:49,204 packs, which is better than the lottery but pretty rare for a card set. In fact, there are believed to be only ten of these cards in existence making them the holy grail for any card collector. As previously noted, Ford has appeared in sets since then, albeit still in limited numbers, but his cards remain the most rare and highly sought-after cards in the Star Wars trading card market and this card will most certainly appreciate in value considering it was the first and so limited. 2012's Galactic Files set was only the second to feature a Harrison Ford autograph and was quick to command top dollar on the trade market. Autos in this set are on stickers and were included in every-other hobby box, alternated with embroidered patch cards. Hobby boxes are still available online for the collector who loves the thrill of the hunt and with such an extensive checklist it will take more than one hobby box to complete the set. The Jedi Legacy set was the first Star Wars set to contain relic cards like film cells and costume pieces. 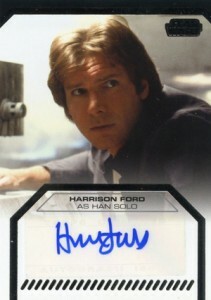 The 17-card autograph checklist, which includes Harrison Ford, was distributed in one of every three hobby boxes and Ford was a short print so these sticker autographs will be hard to track down. The set, overall, was met with a great deal of critical reception for a number of reasons and prices for cases have dipped enough to make this a fairly reasonably-priced set to collect. Harrison Ford autographs from this set do not show up on eBay very often nor do they last long once they're posted so tracking down this particular card may take some patience and a great deal of money. The odds of pulling a Ford auto out of the Chrome Perspectives set are incredibly low. 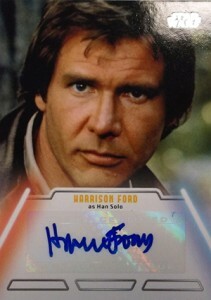 Aside from autos being distributed in only 1:91 packs, the solo Harrison Ford autograph card is one of the two redemption cards in the collection. Naturally, the second redemption card is a 1:36,500 triple autograph with Harrison Ford, Carrie Fisher, and Mark Hamill. There are few completed online auctions with a Harrison Ford autograph from this set with listings ranging from several hundred to over a thousand dollars. The Mark Hamill and Carrie Fisher autos from this set have sold from $200-$800 in the year following release but a Ford auto from this set would, most likely, be a crown jewel in any entertainment card collection. The Masterwork series includes one autograph per master box. There are 40 subjects in the initial set of autograph cards, including Harrison Ford, with four parallel sets that total 64 or fewer cards (28 or fewer Frame, 25 or fewer Foil, 10 or fewer Canvas, and one Wood) per person. Each hobby box in the High Tek set, due in December 2015, includes one autograph or one sketch card. 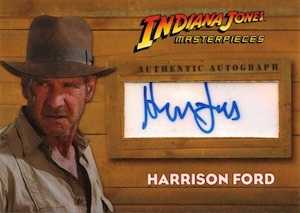 Although he is tentatively included in the autograph set, it is possible that the Harrison Ford card may be a redemption which would make this a very difficult card to locate. Following his wildly popular Star Wars card in 2007, the elusive Harrison Ford managed to put pen to card and sign eight cards for this retrospective Indiana Jones collection. In general, the odds of pulling an autograph from this set is 1:42 but the odds of pulling Ford (or Lucas or Spielberg for that matter) is closer to 1:97,000. Other cards from this set have sold for significant value but the only comparable cards, Spielberg and Lucas, are either equally as rare on the open market. It is worth noting that the Heritage sets, which can be found fairly inexpensively now, were hobby/specialty-exclusive sets. 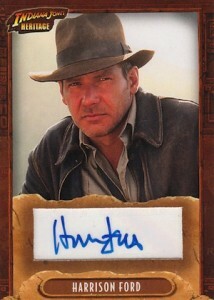 2008 saw the release of three different Indiana Jones card sets and all featured autographs of Harrison Ford. The Crystal Skull set, released to coincide with the latest Indy film, features several autograph cards and, like the other 2008 release, a very limited run of cards signed by Ford, Spielberg, and Lucas. Official odds of grabbing a Harrison Ford card out of this set are not available but it is safe to assume that the likelihood is similar to former sets and that there are fewer than 20 cards in this set that feature his autograph. This third and final set to be released in 2008 was met with modest excitement from collectors but is a unique set in that each base card is an artist rendering as opposed to photographs and production stills. Again, the dynamic trio of Lucas, Spielberg, and Ford contribute signatures to the set but, again, they each signed only seven cards which means your odds of grabbing one of these is approximately 1:7000. There was also a single card released that featured all three, but it has already been pulled so your odds on that one are 0:infinity. 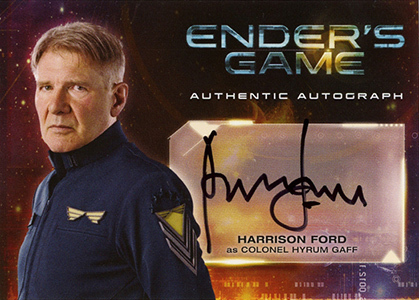 Based on the 2013 film of the same name, the Ender's Game set by Cryptozoic includes an autograph card in every 24 packs (one per hobby box) and the most popular one of the set is, obviously, Harrison Ford. In September, 2015, one of these cards sold on eBay for $899.99, proving the worth of Ford's signature is larger than the popularity of the film. While it is unclear just how many Ford signatures are included in this set, it is among the easiest signed cards to track down online and can be yours as long as you're willing to pay a pretty penny. Because of the near identical design, the 2010, 2011 and 2012 Pop Century cards are merged into one listing. Harrison Ford's autograph is included in each of these sets as short prints. The trade market can be very significant for these elusive collectibles as they are "generic" Harrison Ford cards and incredibly limited in release. I have a 2008 Tops signed card with all 3 signatures for sale. Harrison Ford. Steven Spielberg and George Lucas. Mint shape! Card has holllogram and certificate. Yes how much cyndi ?